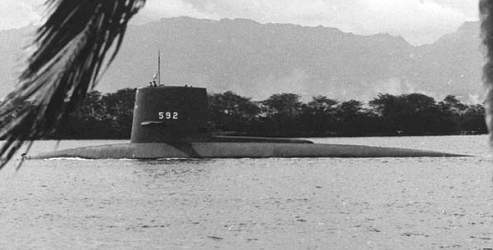 The sixth and final SKIPJACK - class nuclear-powered attack submarine, the USS SNOOK was the second ship in the Navy to be named after the robalo of the Atlantic that is bluish-gray above and silvery below a black lateral line and attains a length of about four feet and a weight from 15 to 20 pounds. Decommissioned on October 16, 1986, and stricken from the Navy list on November 14, 1986, the SNOOK entered the Navy’s Nuclear Powered Ship and Submarine Recycling Program at the Puget Sound Naval Shipyard, Bremerton, Wash., on October 1, 1996. Recycling was completed on June 30, 1997. Builder: Ingalls Shipbuilding Corp., Pascagoula, Miss. This section contains the names of sailors who served aboard USS SNOOK. It is no official listing but contains the names of sailors who submitted their information. 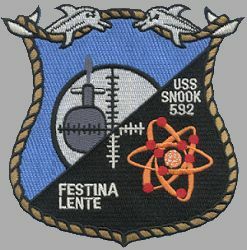 Click here to see which USS SNOOK memorabilia are currently for sale on ebay. October 25, 1972 Dabob Bay, Wash. The SNOOK is slightly damaged when she strikes bottom in Dabob Bay, Wash., while on a celebration run. The SNOOK is able to surface without any problems. April 23, 1975 30 miles off San Francisco, Calif.
USS SNOOK becomes entangled in a net of a probable Soviet fishing trawler while submerged at a depth of 150 feet in a submarine diving area off California. The SNOOK is pulled to periscope depth immediately astern of the trawler, however, SNOOK breaks free and clears the area. About 25 Soviet fishing vessels are in the area at the time of the incident.